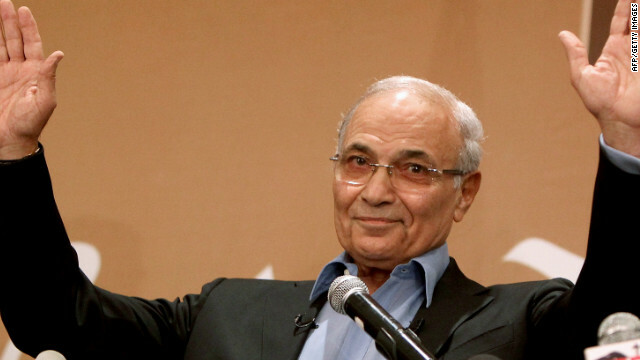 Former Prime Minister Ahmed Shafik is claiming victory as Egyptians await presidential election results. Cairo (CNN) -- As Egypt's generals warned of potential chaos, thousands of civilians jammed Tahrir Square late Friday, eager to learn results of last week's runoff election and see the country move away from military rule. The nation's election commission delayed the release of the results Thursday to an unknown date, feeding speculation over whether Ahmed Shafik or Mohamed Morsi will prevail. There were conflicting reports on the website of the semiofficial news site Ahram Online. Shafik, the last prime minister under former Egyptian leader Hosni Mubarak, will be named the country's new president Sunday, Ahram reported on its English version Friday, citing several unnamed government sources. Shafik will be declared victor with 50.7% of the vote, the news outlet said. But the site's Arabic version quoted election commission officials as saying Morsi, the Muslim Brotherhood candidate, remained in the lead. There's been no official confirmation from the leadership in Cairo. Both Shafik and Morsi have claimed they've won the election. An electoral official said authorities are reviewing about 400 electoral violation reports submitted by the two candidates. Earlier Friday, Egypt's military rulers said they won't reverse their widely deplored constitutional and judicial changes and warned politicians to keep a lid on election-related unrest. "We will face anyone who will pose a challenge to the public and private sectors with an iron fist," the Supreme Council of the Armed Forces said. The country's constitutional court dissolved the lower house of parliament last week, extending the military's power and sparking accusations of a coup. The military council recently announced it had full legislative authority. The Muslim Brotherhood, the country's largest Islamist group, was the dominant party in the parliament. Under an interim constitutional declaration, the military council retains the power to make laws and budget decisions until a new constitution is written and a new parliament elected. The declaration said Supreme Council members "shall decide all matters related to military affairs, including the appointment of its leaders." The president has the power to declare war, it says, but only "after the approval" of the Supreme Council. In its statement, read on state TV by a military official, the Supreme Council said the judiciary is a pillar of Egyptian society. "All decrees issued by the judiciary system must be respected and implemented because they represent the people. It will be considered a crime if anyone objects to the ruling or attempts to block its implementation," the military said. It said the constitutional declaration was a "necessity that the current situation posed in administrating the affairs of the nation during the critical current phase of our nation's history. Whatever is issued from SCAF is based on the high interests of the nation, nothing else." The military council said it does not favor one political entity over another and respects everyone's "rights for peaceful demonstrations that keep in consideration the high interests of the nation." And it stresses the importance of self-restraint and respect for authority. It said announcements of unofficial presidential results are "inexcusable" and sow political divisions. Both candidates have claimed victory in the runoff. The Supreme Council urged political entities to respect democracy and "abstain from all possible acts that may descend the country into a full chaos." Mubarak ruled Egypt with an iron hand and as a staunch ally of the United States, which gives the nation $1.3 billion a year in military aid. Egyptian reform leader Mohamed ElBaradei -- the former head of U.N. International Atomic Energy Agency and the winner of a Nobel Peace Prize -- said he's been in close contact with the military council and the intelligence services on the one hand and Morsi on the other and has urged them to avoid a showdown. He said that if Shafik, seen as a candidate of the pro-Mubarak old guard, is declared the winner, "we are in for a lot of instability and violence ... a major uprising." He isn't as worried about a Morsi victory because Shafik supporters are unlikely to take their anger to the streets, he said. He described the current situation as "a total, complete 100 percent mess." Muslim Brotherhood lawmakers met with political leaders to discuss plans for a coalition to fight what they believe is a power grab by the military, according to the Facebook page of its Freedom and Justice Party. "We will NOT accept this coup against democracy," it said, adding that "together, we will march on to complete the revolution." More than 800 people died and 6,000 were wounded during the uprising that ended Mubarak's 29-year rule in February 2011. Mubarak and his former interior minister, Habib al-Adly, this month were convicted of ordering security forces to kill anti-government protesters and were given life terms. But other top aides -- as well as Mubarak's two sons, who had been tried on corruption charges -- were acquitted.